He may have been, at times, deliciously incompetent, but his impulsive or uncontrolled failures came closer to art - and are certainly likelier to spark the imagination of artists - than the calculated successes of those whose greater skill masks lesser inspiration. Such found objects of cinematic wonder converge with a wonder at existence itself. ...as if to say, "what did you know about my husband's fondnesses before we were married?" Brody's point about the fiercely expressive converging with the ridiculous is well taken in just how wide, and how long, Crawford holds this precise expression, which boils over just as Pevney cuts the shot, and the heat. Where I'm not sure I agree with Brody is when he says, "The essence of [Pevney's] art is, to a great extent, his lack of authority." 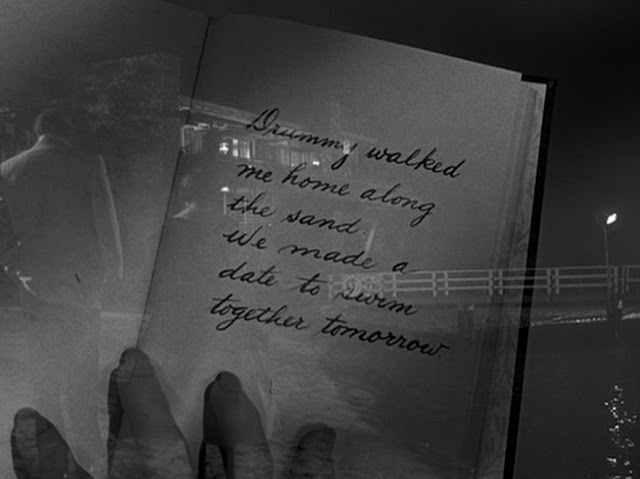 While he unquestionably is more than open to a certain wildfire element of cinema, there's a passage in Female on the Beach that's as beautifully, and specifically, executed as something out of Hitchcock (Vertigo and the Master of Suspense's own abandonment of emotional control, Marnie, sprang to mind immediately). Mrs. Markham has become friendly, on her own icy terms, with beach bum Drummy (Jeff Chandler), whose relationship with an elderly couple (Cecil Kellaway and Natalie Schafer) is a great deal more sinister than the familial terms on which they present themselves, the nature of which is unmistakable given the way the film opens, but which is explicated a great deal more when Mrs. Markham finds the diary of her former tenant, Mrs. Crandall. ...other times they're wildly claustrophobic and sinister, as characters begin to exist on, we acknowledge, two separate planes, but because of the crushing nature of two-dimensional photography, seem to sit side-by-side. 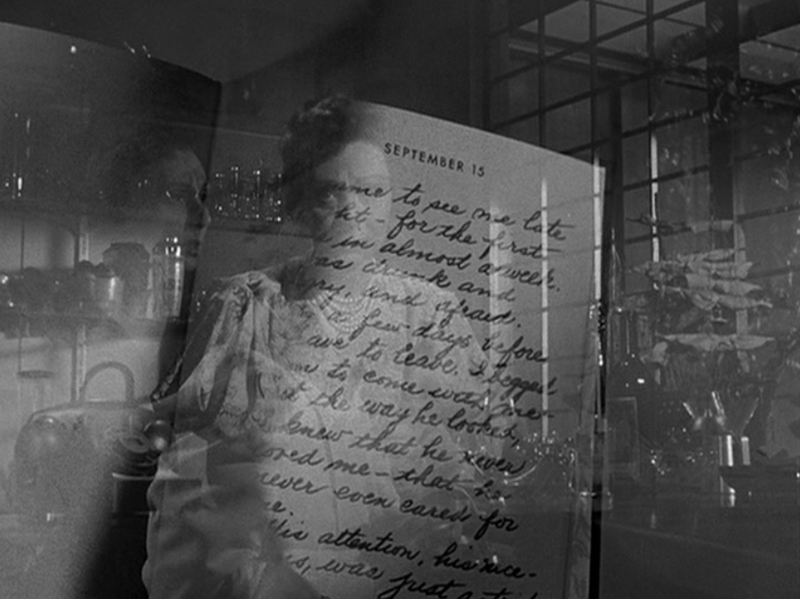 In one moment that doesn't quite translate into stills but is boldly evident in motion, Mrs. Crandall comes in and comforts herself. Here, she seems actively concerned over her own well-being (and the eye peering out, just pass us, through the page is certainly cause for concern), even though the two Mrs. Crandalls in this image are far apart, temporally and emotionally. The extent to which Pevney planned how these images would interact is, of course, impossible to say, but also represents its own kind of authority - the certainty that the total sequence would yield a particular effect, regardless of the particulars, and that it does. Crawford's manner upon arrival is pretty distinctly standoffish, though she rarely descends into outright rudeness; it's a sort of polite contempt, rigid and unrelenting. 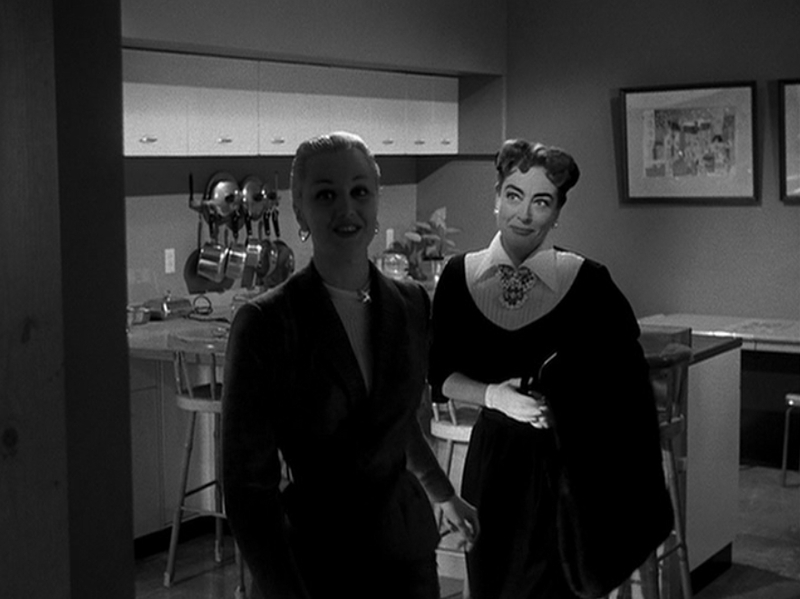 She has to make a very definite departure from here, and while Crawford is a skilled (and unpredictable) enough performer to sell that transition, Pevney does her, and us, a great service in using such a bold and terrifying sequence to set her off. That it, coming so early, is perhaps the highlight of the film should not indicate that the film is somehow lesser for peaking early, as the thematic and dramatic waters it then enters are more than vicious and lurid enough to engage. For whatever tameness to which the story may succumb, it always navigates towards some strange, sideways, and (thus?) all the more effective means of expression, often in the images but, not to be discounted, also in the dialogue ("He's very tall, isn't he?" a detective asks Crawford of Drummy, in a manner that makes clear he's talking about everything except the man's height). As straightforward women-in-danger thrillers go (and its placement in a TCM boxset of the same name is not unreasonable), this one is anything but.